I just received the newest release, Until After Then, from Tommy Talton and it is a mixed bag of cool tunes. 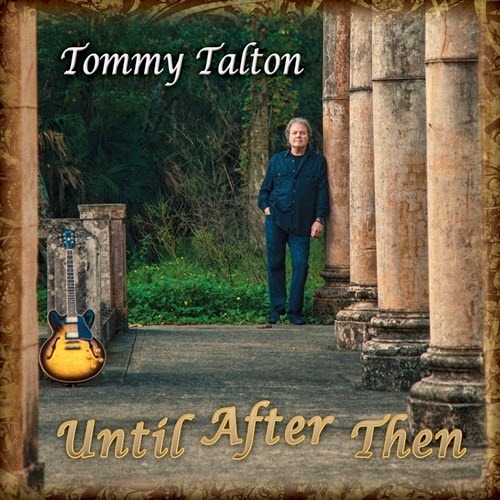 Opening with title track, Until After Then, Talton creates an almost Steely Dan like pop jazz feel with Matt Slocum on organ, Frankie Nattola on bass and David Keith on drums joining Talton on guitar and vocal. Real Sugar has a super Al Green like R&B strut. Kevin Holly adds a cool wah wah guitar, Billy Earheart electric piano, David Hood bass, Bill Stewart drums but it is the cool sax work of Brad Guin and trumpet work by Ken Watters added to Talton's vocals that pushes this one over the top for me. Nice! Mr. Love is an easy rocker which actually reminds me quite a bit of Joe Walsh when he plays it mellow. Another cool track. That Distant Light has a super sweet Paul McCartney like melody. Talton continues to show his versatility as both a songwriter and singer. My, O, My again has a McCartney kind of sound with a quiet beauty. Talton does show a little slide work on this track and it's smooth as silk. I Keep My Mind On You changes directions radically ending up in Margaritaville. With an island feel, Holly on 12 string, Earheart on keyboard and Watters' trumpet accents, this track could easily hit the airwaves hard. She Was There is a fresh sounding pop ballad with Talton leading the way on vocal and acoustic guitar and clean piano lines by Kenny Head. The Man From Down Near Waco has a simple country western ballad feel with a pinch of rock. John Kulinich plays a cool western style guitar riff adding a nice touch. Love U A Little is a simple ditty with some real smooth acoustic dobro slide work. You Got A Friend has a catchy melody, clever rhythm and warm vocal harmonies. Wrapping the release is instrumental, Surfin' The Levee, a funky rock track with Talton on distorted vocals and guitar, Keith Head on organ, Brandon Peeples on bass and David Keith on drums. Talton does stretch out a fairly cool guitar solo on this track. This is a really nice jam to wrap up a primarily mellow release.